A tumor suppressor gene, or antioncogene, is a gene that protects a cell from one step on the path to becoming a tumor. Currently, no treatment has been proven to be one-hundred percent (100%) effective to destroy NF2 tumors or even simply stop all NF2 tumor growth in any individual; however several are in different stages of Clinical Trials of Chemotherapy type treatments. The goal with the Clinical Trial options is to treat all tumors at once, and to date, there have been a few options that have been found to have some success with certain tumor types and none of the options available works for everyone with NF2. The only primary method of treatment for NF2 tumors is different forms of microsurgery (surgery) including but not limited to complete or partial tumor removal. The problem with any of the surgical options is it can typically only allow for treatment of one tumor at a time. Inability to treat more than one tumor is a problem since it can take months to heal before more tumors can get treatment. There are issues but occasional advantages to radiotherapy or radiation treatments, however, there can be long-term consequences to these treatments. People with NF2 can have unique issues to these treatments, in comparison to people having Radiotherapy or Radiation Treatment for other reasons. 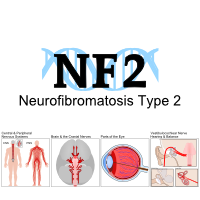 No treatment for NF2 has been found effective for all tumor types, or this section would be labeled, The Cure and since treatments at best sometimes alter one (1) tumor type, these treatments are called targeted tumor drug-therapies. Some of the treatments sometimes Schwannoma tumors in some individuals for a period and a trial to help treat Ependymoma has just been started which has not gone far enough into early stages to know if it has helped anyone at all. Botanical treatment options are things grown naturally which result in fewer or no side effect issues when taken long-term, provided these things are eaten or taken in. Some do in fact have side effects when not taken in moderation, which can be difficult to determine when taken in pills or capsules.